A Legendary Paladin minion and a Common Mage Spell were revealed in a Hearthside Chat video with Peter Whalen. 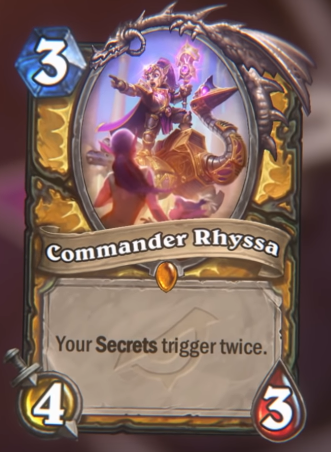 Commander Rhyssa is the guard captain of Dalaran. It's intriguing that she's a Gnome Paladin, given that this combination isn't available (yet!) in World of Warcraft. Rhyssa comes with vanilla stats and a pretty juicy effect. The problem is, even with the new No Surrender Secret, Paladin doesn't have that many and that powerful Secrets in Standard and playing Secrets from your hand is considered bad. If you are wondering how Commander Rhyssa is going to work with Redemption, according to Liv Breeden, she doesn't come back twice with it; however, if a different minion dies while she's up, you'll get two of that. This is really difficult to judge. My first thought, when I saw it, is that it reminds me of a worse Breath of Sindragosa with Twinspell. 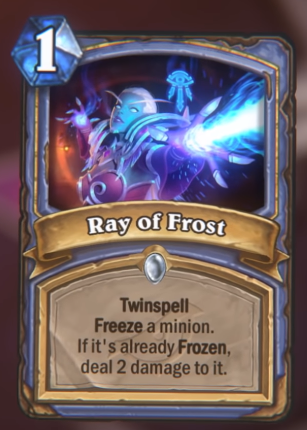 Upon further examination, I realised it is a essentially a 2-mana "Deal 2 damage and Freeze a target for two turns", which is a mediocre deal. 1-mana cards are usually the ones to look out for and this can become free with Sorcerer's Apprentice, while it works well with Vex Crow and Wild Pyromancer. Based on its cheap cost and versatile effect, quite a few people think this card is a sleeper. I guess we'll have to see how good Twinspell will actually be in play. Did I already said that who am I is none of your business? I'm hyped for wild secret paladin. I'm not sure if this will work or not, but I think I'll try. Commander Rhyssa looks like an avowal that paladin secrets are weak, and an attempt to make them valuable again. I like the idea. We may see another new Paladin secret in this expansion. Rhyssa is a very interesting card. I always hated Mysterious Challenger - and in wild she will be a great addition to him. I am curious if there will be more Paladin secrets for standard. She alone won't be enough to make a secret paladin in great deck in standard.